Navigating On Cinema’s Giant, Underground UniverseA guide to Tim Heidecker and Gregg Turkington’s series and everything that it has spawned so far. Enter the Demented Mind of Sarah Squirm With Adult Swim’s New InfomercialPresenting a bizarre, disgusting, and groundbreaking new hair-removal procedure. The Shivering Truth Will Fill the Wonder Showzen–Shaped Hole in Your HeartVernon Chatman’s new stop-motion series is disturbing, terrifying, and amazing. 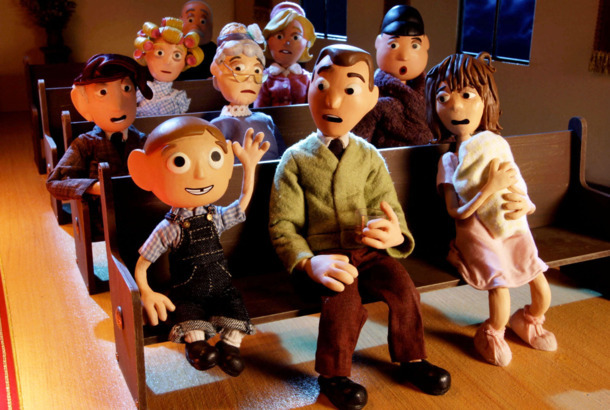 Moral Orel Paved the Way for the Depressing Cartoons of TodayTalking with Dino Stamatopoulos, Carolyn Lawrence, and Scott Adsit about the show that was too bleak even for Adult Swim. Adult Swim Orders Animated Series Tigtone and The Shivering TruthThey both sound very weird and very different. Rick and Morty’s Creators on the Show’s Best and Weirdest MerchSome are fan-made, others are official, and none of them will make any sense to those uninitiated. A Comprehensive List of Every Rick and Morty Universe So FarIncluding that dimension in which everyone looks like Eric Stoltz in Mask. Rick and Morty Season-Finale Recap: Independence DayIs this the end of Rick and Morty? Rick and Morty Recap: A Trip to FroopylandBeth and Rick are exactly the same. Rick and Morty Recap: Tales From the Citadel“The Ricklantis Mixup” is the best kind of unexpected episode. Rick and Morty Had the Most Savage Game of Thrones Burn Last NightRIP discernible character motivations. Rick and Morty Recap: The DetoxRick and Morty try to rid themselves of their toxic traits. Rick and Morty Recap: A Rick and Jerry AdventureRick and Jerry would be much better people if their paths never crossed. Rick and Morty Recap: A Vat of RedundancyEpisodes like “Vindicators 3” are the bread and butter of Rick and Morty. Rick and Morty Recap: Other People’s Problems“Pickle Rick” is a Freudian acid trip. Rick and Morty Recap: After the Boom-BoomThis is Summer’s show and everyone else is just living in it. Rick and Morty Is One of the Best Shows on TVThe Adult Swim series isn’t just a bawdy riff on science-fiction clichés. You Can Watch the Rick and Morty Season 3 Premiere Right NowSome salve for those tender April Fools’ Day burns.